In November last year, 2018, that redoubtable opponent on Fascism and Zionism Tony Greenstein put up an article attacking the Likud government and the Israeli state for trying to discourage mix marriage between Jews and Palestinians, entitled ‘Israel’s War on Interracial Relationships and Miscegenation’. The article was provoked by the controversy in Israel over the marriage of Lucy Aharish, an Arab TV news presenter, and Tsahi Halevi, the star of the TV series Fauda. The marriage was denounced by Interior Minister Aryeh Deri and Oren Hazan, a Likud backbencher, as well as Yair Lapid, the head of the Centre Party, Yesh Atid. The article also reported how various Israeli towns, like Petah Tikva, have tried to stop Jews socializing or marrying with Palestinians. That municipality has set up a special team to tackle Jewish women dating Arab or ethnic minority men. In the East Jerusalem settlement of Pisgat Ze’ev a vigilante group of young men patrol the streets seeking to disrupt any romantic meetings between Jews and ethnic minorities. As well as Petah Tikvah, Tel Aviv and Kiryat Gat also have government sponsored campaigns to prevented racial mixing. There’s even a counselling programme for Jewish women in an interracial relationship, as well as phoneline for people to ring to inform on Jewish women going out with Palestinians. The religious organization, Yad L’ahim, also assists these campaigns with its Anti-Assimilation Department, which has produced a video for use with the police. Back in 2011 Tzipi Hotoveli, in her role as Chair of the Status of Women Committee in the Knesset, invited the racist far-right party Lehava to speak on how marriages between Jews and non-Jews could be prevented. The Education Ministry under Naftali Bennett also removed two books from the English language curriculum, Borderlife and Trumpet in the Wadi in 2015 and 2016, because they were romances between Jews and Palestinians. The article also notes that there was a similar controversy over the marriage of another mixed couple, Morel Malka and Mahmud Mansour. Civil marriage does not exist in Israel, so Malka converted to her husband’s religion, Islam. The couple’s wedding ceremony was marked by a demonstration by Lehava, whose members screamed anti-Arab slogans, including ‘Death to the Arabs’. Because for Zionists, mixed marriage is not so much a religious as a racial/national matter. Race in Israel is defined by religion, hence why inter-marriage is not so much considered a sin as a form of treason. That was what an opinion poll found in Yediot Aharanot. Over half Israeli Jews believe that marriage is ‘national treason’. ‘Marriage to an Arab is national treason’. This stance against racial intermixing is very similar to that of Apartheid South Africa and the American south during segregation. And, although the IHRA definition of anti-Semitism states that it is anti-Semitic to draw comparisons between Jews and Nazis, it is also very similar to Nazi Germany. The Nazis also passed legislation to prevent intermarriage between Aryan Germans and those peoples they judged inferior, like Jews, Gypsies, Slavs and Blacks. The Aryan races-often in absurdly small numbers-overthrow alien nations, and favoured by the numbers of people of lower grade who are at their disposal to aid them, they proceed to develop, according to the special conditions for life in the acquired territories-fertility, climate, etc., the qualities of intellect and organization which are dormant in them. In the course of a few centuries they create cultures originally stamped with their own character of the land and the people which they have conquered. As time goes on, however, the conquerors sin against the principle of keeping the blood pure (a principle which they adhered to at first) and begin to blend with the original inhabitants whom they have subjugated, and end their own existence as a peculiar people; for the sin committed in Paradise was inevitably followed by expulsion. Adolf Hitler, My Struggle (London: Paternoster Row 1933) 121. The Israeli state’s attempts to ban interracial romances and marriage is therefore exactly the same as that of South Africa, segregation America, and Hitler’s Germany, regardless of the IHRA’s attempt to rule out any discussion of it as ‘anti-Semitic’. It is part of the regime’s colonialist nature and subjection of the Palestinians. I found this description of the apartheid and maltreatment inflicted on the Palestinian Arabs by the Zionist settlers in History of the World: The Last Five Hundred Years, general editor Esmond Wright (Feltham: Hamlyn/W.H. Smith 1984), page 629. The most serious long-term problem bequeathed by Britain’s devious wartime diplomacy in the Middle East arose from its promise to the Jews. The terms of Britain’s mandate in Palestine made it responsible for putting this promise into effect by the establishment in Palestine of a ‘national home from the Jewish people.’ The Arabs, who made up more than ninety percent of the Palestinian population, were at once assured by Britain that the Jewish national home would not become a Jewish national state and that their ‘civil and religious rights’ would be respected. A national state, however, was precisely what the Zionist movement (which was responsible for the idea of a ‘national home’ in Palestine) intended to achieve – a state which, in the words of Dr. Weizmann, its leader, would be ‘as Jewish and England is English’. As a first step towards this goal, Zionists insisted on the strict separation of Arab and Jewish communities. Jewish parents refused to send their children to mixed government schools. Arab tenants and farm workers were evicted from all land bought by the Jewish National Fund. David Ben-Gurion, later the first prime minister of the state of Israel, organised a series of strikes against Jewish employers of Arab labour. The Jewish Agency, which coordinated Jewish settlement in Palestine, sought, with some success, to make itself a state within a state. Until the First World War the Arabs had been the only people living in contact with the Jews who had never persecuted them. The birth of Arab anti-Semitism between the wars was the work not of Adolf Hitler but of the Zionists. This last statement has to be revised somewhat, as the Nazis sought to exploit Arab resentment against the Zionist settler through the creation of a vicious conspiracy theory tailored towards Islam similar to their own monstrous delusions about the Jews being responsible for the exploitation and enslavement of White Aryans. In their spurious history, the Jews had been conspiring against Islam and the Arab people since the days of Mohammed. It’s completely bogus, but because of the establishment of the state of Israel and its seven-decades long persecution of its indigenous Arabs, has understandably become widespread in the Arab and Muslim worlds. This page also mentions the way the British tried to contain some of the pressures by limiting Jewish immigration to Palestine by imposing a quota and turning away emigrant boats. This meant returning Jews fleeing Nazi persecution back to their deaths in Germany and occupied Europe. Apparently the policy was to take any illegal prospective settlers to Jerusalem, so they could see it, before returning them to their boats and sending them away. I’ve known elderly members of my church, who were young sailors in the British navy at this time, and they very much did not like what they had been ordered in turn to do to the Jewish immigrants. And in particular this was the use of tear gas against refugees from the Nazi gas chambers. This left them very upset as they spoke about it nearly seventy or so years later. This whole, shabby affair is another blot on the history of the British Empire. But the Zionist lobby automatically smears and reviles anyone, who suggests that Israel is an apartheid, racist state which persecutes the Arabs as anti-Semitic. So I’ll guess they’re going to have to smear W.H. Smith now, for what they rightly published back in the 1980s. 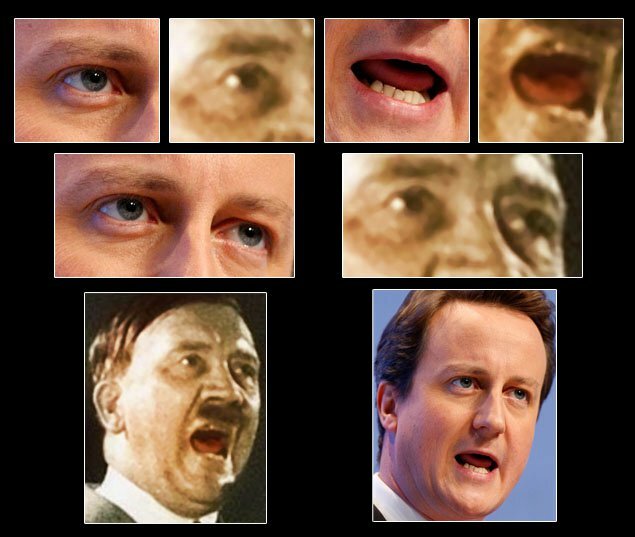 Hitler and Cameron: Both promote the power of elites and the subordination of the masses. (Dennis, The Coming American Fascism, pp. 229, 231, 237). This also exactly describes the attitude of the current Coalition, led by the aristocratic Cameron, Clegg and Osborne, which is doing everything it can to reduce everyone else to poverty and despair in the interests of big business.